Okay, I know what a banana tastes like. Do I really need a sample? The answer is YES. It tasted like………. a normal banana! *Gasp* 299 yen? That’s like $4 for 5 bananas. I don’t think so. I don’t need that many bananas. 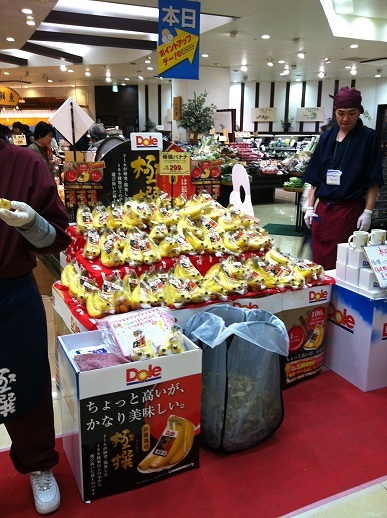 I could buy 5 for $1 at the 100 yen shop. But I did need that banana mug sitting in front of the stand. YES! 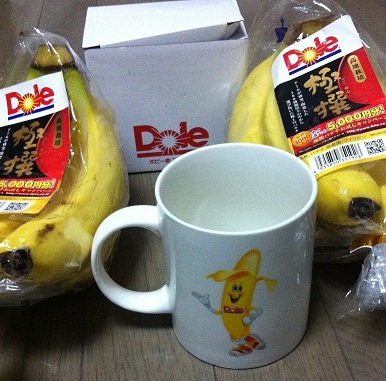 BANANA MUGS!!! Gyaaaa! 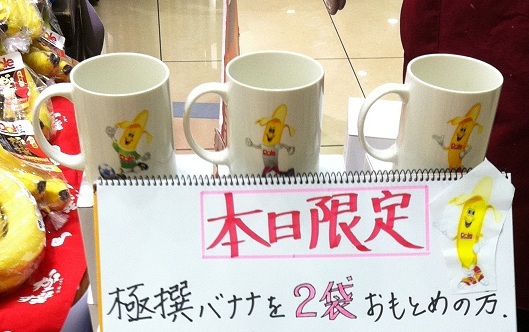 See, the sign says that if you buy TWO packages of 299 yen bananas, they give you THIS FREE BANANA MUG OMFG!!!!!! Remember, folks, bananas are the answer! 😀 But which one did I want?! OH THE CHOICES. I liked the soccer player the best, and then the running one was cool, but I can neither play soccer nor run because of my back injury, so it wouldn’t do for me to feel nostalgic every time I looked at my freaking AWESOME mug, so I got the “Hey how’s it’s goin’?” style. I know why my should hurts, I know why my leg hurts (I’m limping a little less now that the swelling has gone down), but I have noooo idea why my lower back hurts so much. ;o; Why can’t I stay healthy? That aside. I chatted with my new co-worker Karla as she waited for her hubby to finish work. I like her a ton :D.
I love my work-place, I love my co-workers la la la ~^_^~ but I hate my body. ^^;;; But seriously, the best thing about not having a fight set is that I don’t have to FREAK OUT and feel that crushing pressure and stress when I get hurt. I can just freaking go home and not worry about weight or whatever.